I think we really need to find out why FCP X is creating these invalid fcpxmls, and to do that, we would need a clip that exhibits this problem and to know what settings you used when you imported the clip into your library. Are you able to provide a small clip and take a screen grab of the options that you are using when importing it? 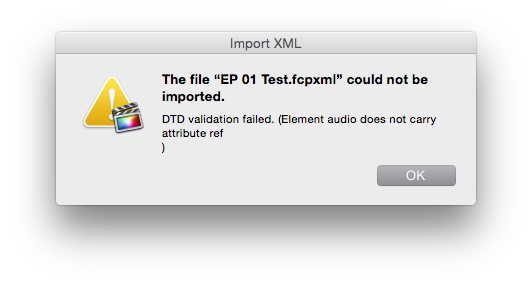 Can you import that fcpxml back into FCP X? I made the test with only a media on the timeline. I always have a problem. Last Edit: 4 years 2 months ago by Andre Michaud. 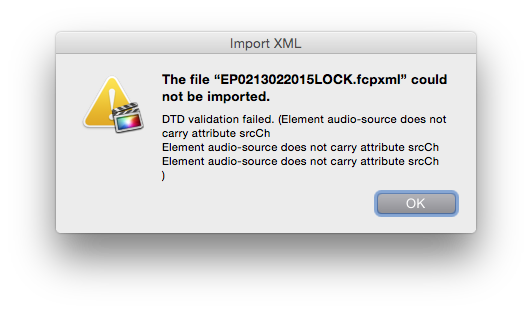 The file "EP0213022015LOCK.fcpxml" could not be imported. The error message is basically saying the same as the X2Pro error message; The fcpxml is invalid. Is this an error message from X2Pro? Can you attach the fcpxml that causes this error message? 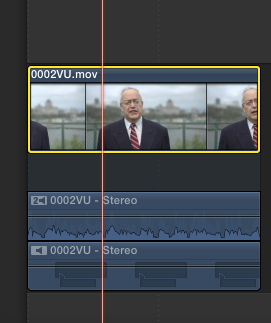 I have import my clip and to replace in the timeline and that works. Do you have any other files like this one, but smaller, that cause the same error message? How large is the file? Would you be able to upload it if I can give you FTP details? Sorry, I was talking about the mov file (00074W.mov) not the fcpxml file. Can you tell me how that was created and imported into FCP X?